When you think about all that goes into preparing for a concert, performing can seem like a delicate skill, something akin to tightrope walking. I’ve found that many musicians think along those lines. But I’m convinced that performing can be as natural as having a conversation or sharing in a game. Even beginners can perform confidently, provided that the task is simple, the situation is friendly, and their intentions are wholesome. As an illustration, let’s consider piano lessons: Almost any novice pianist, in her initial lesson, is able to learn a four-measure melody involving three different pitches. Then, with her teacher as the audience, she can perform the tune. No pressure; no big deal. She enjoys expressing the music similar to the way she might take pleasure in tossing a ball. That might seem like an obvious first-lesson format: The student learns an excerpt or exercise and then performs. After all, it’s a music teacher’s job to teach music performance, so what else would you expect? If performance is the goal of music study, and it is, then performance skills—such as how pieces are begun and concluded on stage—should be woven into every lesson. 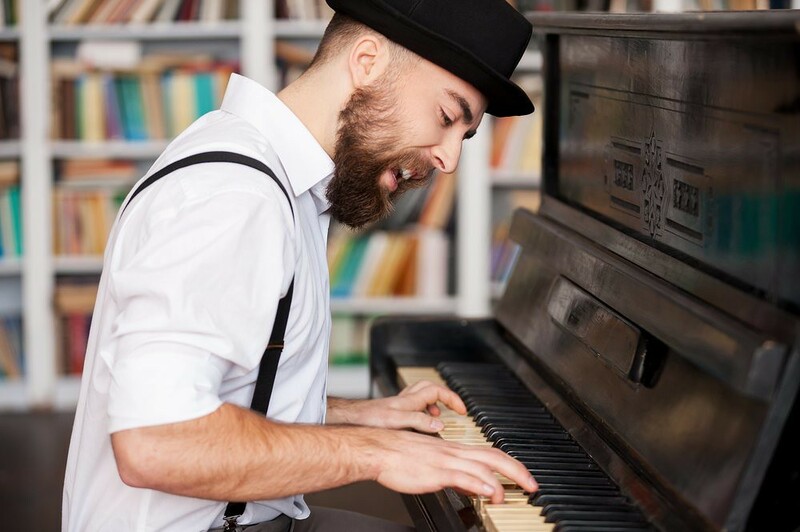 All music students should go into their teachers’ studios knowing that what they’ll do relates to the big picture of connecting with listeners. When music teachers deprive students of performance education, they do them a terrible disservice because the omission doesn’t just create a knowledge gap; it also instills performance anxiety. Anxiety takes hold because, if performance skills are ignored in lessons, then when a student eventually steps on stage, she won’t have a clue how to maintain control, much less how to be an artistic communicator. As far as the student knows, she should be able to perform well. That’s what everyone, including her teacher, seems to believe. But lacking familiarity with performance situations and with the allied personal and task-centered strategies discussed in Chapter 7 of The Musician’s Way, the unprepared student becomes debilitated when her arousal escalates, and then nervous habits set in. Her plight is analogous to that of an aspiring athlete who enrolls in private basketball training, never plays a game, and is suddenly called on to compete in a five-on-five tournament. No sensible coach would ever teach basketball that way, yet that’s how multitudes of music educators run their studios. That is, unsuspecting music students might attend lessons for as much as a year, without any performance training or experience, and then they’ll be pushed on stage for an annual recital where they get crushed by anxiety. The Musician’s Way is the first book to offer music students and educators a detailed, holistic approach to learning the art of practice and performance. Chapters 1-6 delineate solo and group practice strategies. Chapter 7 explores the inner workings of performance anxiety. Chapter 8 looks into the nature of performing and sorts out the constituents of concert preparation. Chapter 9 maps out ways to craft a stage presence and harness on-stage energy. Chapter 10 covers tactics to deal with errors, practice performing, and evaluate progress. Chapter 11 explores the topics of programming, auditioning, recording, and more. Chapters 12-14 address occupational health, creativity, and career building. My aim is to empower musicians of all ages and levels to confidently perform in diverse settings, pursue lifelong music making, and unleash their musical souls. These points are all so very true. I’ve seen my husband grow in his performing over the years and it came down to learning along the way of course but now he’s with some perfectionist musicians that practice and practice, so when the show rolls around, the nerves are gone and they just enjoy performing and sharing their art with others:). Yes Well said Mr.Gerald…As in the other cases also in the music also as a musician I can also say that we should perform as naturally as having a conversation or sharing the game…I totally agree with you…So have to be confident and perform…Very nice…!!!!!! !